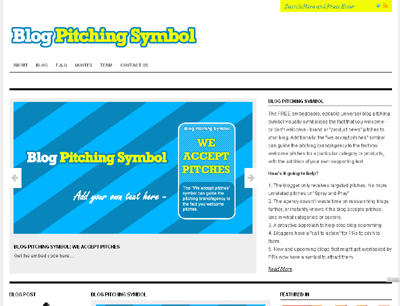 The FREE embeddable, editable universal blog pitching symbol visually symbolises the fact that you welcome – or don’t welcome – brand or “product news” pitches to your blog. Additionally, the “we accept pitches” symbol can guide the pitching brand/agency to the fact you welcome pitches for a particular category or products, with the addition of your own supporting text. 1.It gives bloggers a chance to be pitched to in a sensitive way. 2. Helps get related pitches to your blog only. 3. Especially appealing if you are a new up and coming blog. 4. If you’re already getting heavily pitched too, it can help ease the flow.